Yale Hoists are one of the most common pieces of machinery used for the lifting and lowering of equipment. They are designed to lift a load vertically using a hook that is connected to a chain. 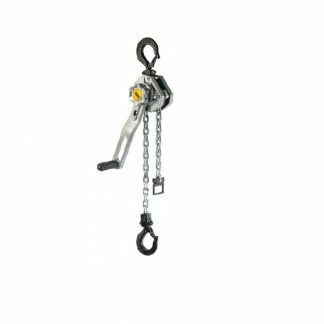 A chain hoist can be either a permanent or a temporary fixing depending on how frequently the site requires a lift.All of the chain hoists offered by Engineering Design and Supplies Limited are suitable to be fitted to a trolley, allowing for easy movement. Like all of our products, they have been designed with close attention paid to efficiency, practicality, and reliability.Our top of the range hoists are available in a variety of capacities, from 125kg up to 10,000kg, so all of our customers can be sure that we can provide exactly what you need. Our range consists of four types of Yale hoist: the electric chain hoist, the ratchet lever hoist, the hand chain hoist and the trolley hoist. All of them come in a selection of models.EDS Limited are a Yale-authorised Master Distributor. This means that we can supply and install any of Yale’s industrial products and we do so at a competitive price. Yale is part of the CM Group, one of the world’s largest manufacturers of lifting equipment, so you can be certain that you are getting products of the highest quality.Our collection of Yale products also includes travel trolleys and beam clamps as well as TPM permanent lifting magnets.